We have made exactly three trips to the Great Sand Dunes since we’ve been together. The first, about thirteen years ago, was sort of on a whim when we decided to go camping one weekend. We packed the car, made the 4-hour trek south (passing a rather grizzly accident on the way), and pulled into the park entrance where we discovered that entry was free that day. Only one campsite was left and we pulled in victoriously before climbing out of the car, stretching our legs, and imaging a night of stargazing and s’mores. Our euphoria was short-lived, however. Upon opening the trunk and pulling out everything we had packed, panic began to set in. An exhaustive search over every.square.inch of the car (including under the seats) revealed that we had left the tent at home and we left in defeat. E suggested that we just make a trip to the nearest Walmart which I found funny. He was still new to Colorado and the mountains and didn’t realize that Walmarts weren’t exactly a dime-a-dozen above a certain elevation (which is certainly not the case any longer as there’s one in Alamosa now which is only about forty-five minutes from the dunes). So we made the 4-hour trek back home. There we found the tent tucked safe and sound behind the front door of our apartment. The next trip was just after B turned two in 2012 when we rented a VRBO cabin in the area. The view was absolutely.positively.amazing from this cabin (which is for sale, by the way!). It stands out as one of the best places we which we’ve ever stayed despite the fact that there isn’t a thing to do in the area aside from the dunes and a lone waterfall. And, finally, last week we decided to try the camping thing again. We crammed all of our gear (including the tent which we checked for at least three times), the kids, and crossed fingers into the car and made the journey south once again. We arrived without incident, found a campsite with a great view, then set everything up (including the tent) before heading to the dunes visitor center. Once there, we picked up a Junior Ranger book for B then headed out again. 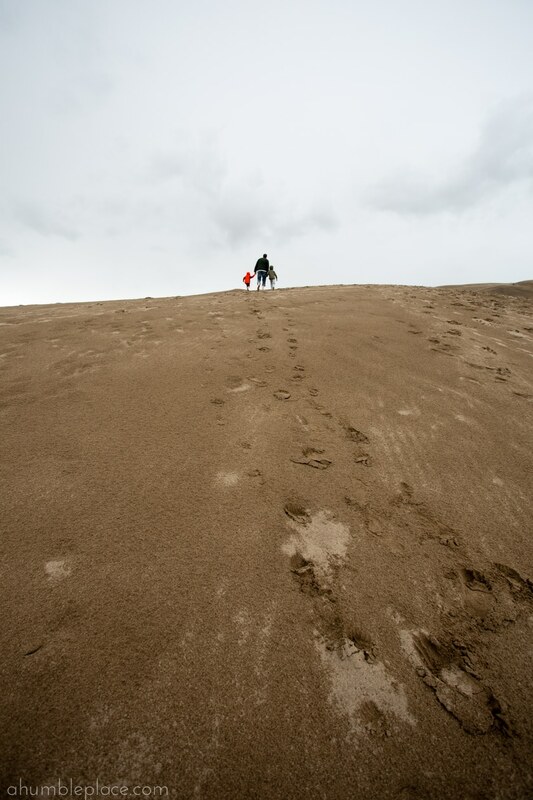 Our romp around the dunes was cold, but exhilarating for the kids. We splashed in the creek and did a few activities for B’s book. Then E, B, and C ran up and down the sand a few dozen times before we headed back to the visitor center to thaw to get complete B’s rangerly duties. He said his oaths, handed in his dunes book (along with his centennial book which we did at home) and got two more badges for his backpack. That was followed by (a windy) supper back at the campsite before I coaxed C to sleep at around 8:30. B headed into the tent shortly after that and while I was keeping the campfire alive (s’mores!) and E was getting B settled, it started to rain. I was hoping that it would only be a few drops, but the clouds had other ideas. Fifteen minutes into the downpour, E and I gave up on our evening around the campfire. We devoured the chocolate bars under the hatchback door on our Forester while watching the fire hiss and sputter. Then we surrendered and climbed into the tent which was was surprisingly dry and warm. Last summer, after our last camping trip, we bought two air mattresses and another double sleeping bag, which made the whole setup very comfortable. The rain on the tent (which stood up well to the weather) was a lovely white noise and I dozed pretty quickly. Unfortunately, the rain stopped after about an hour, which was the end of the peaceful part of the night. Somehow, our campfire had not been completely extinguished during the deluge, so E had to climb from the warm sleeping bag and put that out. Then roaming packs of coyotes began their nightly rounds of howling and yipping at random intervals all night long. But that’s camping, right? The next morning we discovered the matches had been left out in the rain (though not our firewood, which I had stashed in the car). We managed to find another box in the emergency kit that came with the car, so we were at least able to make a feeble little fire. I started up the cookstove for eggs only to discover that they had all broken en route. We did still have a somewhat filling breakfast of bananas and avocado then packed everything up and headed out. I think overall, it wasn’t a bad trip, though obviously there could’ve been some improvements. 🙂 I did also manage to get a few pictures, though mostly of E and the kids wandering far away from me on the dunes. We had some visitors to our campsite after supper. It was surprisingly warm the next morning. There were already people on the top of the dunes by the time we climbed out of the tent. The open area next to our campsite was full of these purple flowers which the hummingbirds kept attacking voraciously.